I’ve been learning to play ocarina. This is wonderful, inspiring and mind-boggling. Thanks to The Library of Congress for providing this! I have one that was made in China, it was expensive, but I figured I might as well spend the money on a good one. Unfortunately, two of the holes are double holes and my fingers don’t cover them too easily. It’s a very nice looking ocarina, though. As far as I know the ocarina came into relatively modern form in Italy so it really took off there. Some of the newer ones coming out of Aisa are very nice instruments but there is a cool funk-factor to the older European ocarinas I have tried. I bought 3 ‘modern’ ones a few years ago, but I don’t like their shape as much as the classic one. They only take ocarionas seriously in Italy, it seems. I have a CD of Italilan ocarina music that never fails to amaze me. 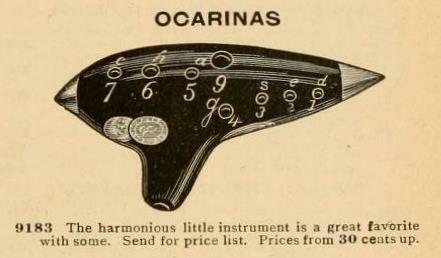 Love those old ocarinas. I have two that I play quite a bit and have recently acquired a modern one that is pretty cool. They definitely are fragile! Found. Not sound. Although that is the problem.